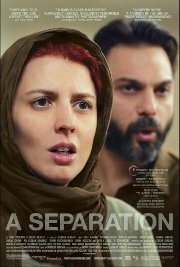 This Iranian film arrives with a long string of awards to its name, including the Best Foreign Language Oscar. The story revolves around a married couple who divorce, leaving dad looking after the daughter and his ill father. He hires a young woman to care for his dad, but when she falls down the stairs and has a miscarriage, her husband sues her employer. The resulting court case brings much to light, leading to complex interplay between the characters as legal and ethical questions in modern Iran are examined. In Persian language with English subtitles. Not to be missed. Comments Foreign film with English subtitles and complex and mature themes of religious dogma explored.